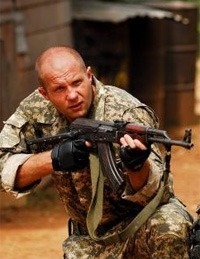 Whatever chance humanity had of defeating Fedor has been eliminated the first day Fedor picked up an AK-47. Fedor Emelianenko with guns is a little redundant. That’s like a bum you see masturbating in an Manhattan subway with a shirt that says ‘I Heart New York’. Of course you heart New York dude, you’re giving your unborn kids a tour of the subway…concrete. Alright, that’s enough. What can bullets do that Fedor hasnt already done with an overhand right? The worst a bullet can do is maybe end a life, Fedor has the ability to end worlds. An overhand right with enough force to puncuture a hole through space and time leaving a black hole in the shape of a fist. Fedor Emelianenko’s first film, The 5th Execution, is now officially in post-production meaning we could probably see Fedor hit the silver screen as soon as August (just in time for Affliction III or as I know it, the end of the world). Fedor Emelianenko’s character in the film just goes by ‘Fedor’ which should be enough to condense this feature film’s length down to the time it takes you to say ‘Fedor’. Regardless of what third world country you’re in, uttering ‘Fedor’ is really all you need to silence any guerilla rebellion. Movie’s over, done. Anything else that takes place is just unnecessary. Emelianenko also inked another deal, a film entitled ‘Karate‘ that’s being produced next year. But check it out, dude’s starring with Andrei Arlovski and your boy, Jean-Claude Van Damme. Sometimes you forget Jean-Claude Van Damme even exists (sort of like New Hampshire). Dude just wrapped up Universal Soldier 3 and until about two seconds ago, you didnt even know. Here’s an idea for a movie Jean-Claude, make a film called ‘Fedor’ which would consists of Fedor Emelianenko just fighting mythological creatures like chimeras and minotaurs to see how long they would last in the cage with him. We don’t need a plot, we already have one: A russian dude beating up stuff. It worked for Rocky IV.